Organizers of Two Three Hunid Oholone Village are still seeking the bureaucratic blessing of the city. 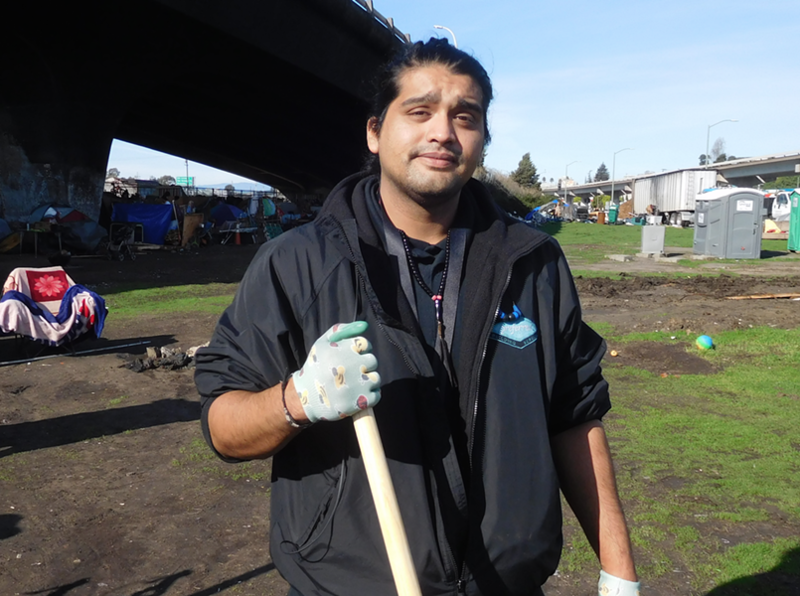 Kaleo Acatar works full time, but can't afford Oakland's rent, so he lives at the camp with his mother. 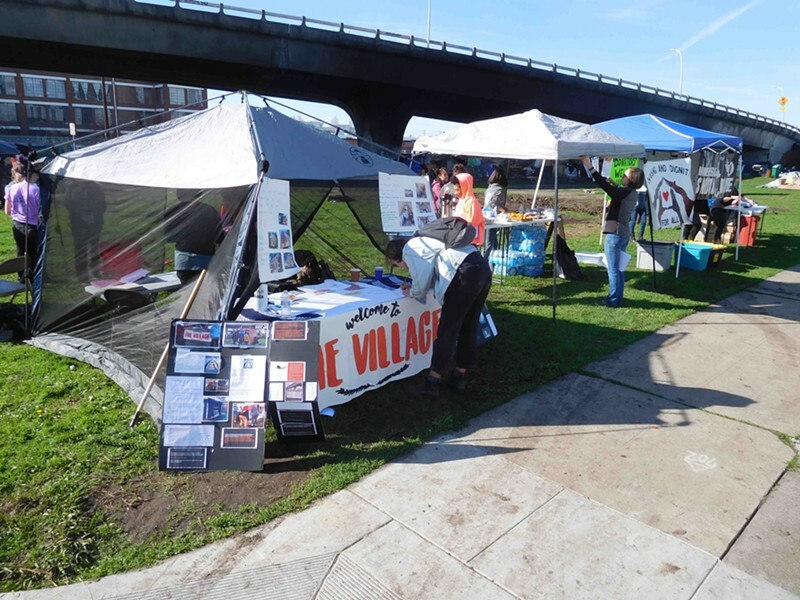 Roughly one year after the City of Oakland closed down an innovative homeless camp known as The Village, the same group of volunteers is reestablishing the project, this time on a large empty lot at E. 12th Street and 23rd Avenue in East Oakland. There's been a camp at this location for years. Kaleo Acatar is one of the camp's current residents. He grew up in the neighborhood and from here he can see the middle school he attended as a teenager, Roosevelt. The last apartment Acatar lived in was only a couple blocks up 23rd Avenue. "This is where I've been almost my whole life," Acatar said. But a few years ago, his apartment building was sold. He said his new landlord slowly started pressuring tenants to move out in order to renovate and double rents. When Acatar's hours at his restaurant job got cut back, he missed a rent payment and was evicted. That's when he and his mother ended up unsheltered. Although he currently works as a contractor for Pixar, his income isn't enough to afford a new apartment while also paying his other bills. Earlier today, he raked trash from the camp's sprawling yard and began mulching the mud with wood chips from a giant pile that was delivered this morning. "It'll be good," he said about the plans for The Village's second iteration. He's looking forward to the greater sense of organization and resources that will be available to the camp's residents and also nearby neighbors. Acatar was one of the advocates who put pressure on the city last year to provide more services at homeless camps. The Village and the Homeless Advocacy Working Group helped to change the city's approach toward homelessness. Oakland began putting portable toilets and hand washing stations at the larger camps throughout the city. And recently, the city opened its own sanctioned Tuff Shed camp in West Oakland (although the city simultaneously evicted dozens of homeless people from the surrounding Brush Street camp which had been there fore years). The biggest challenge, say organizers with The Village, is convincing the city and other authorities to decriminalize homelessness and sanction camping. Citing health issues, the city still removes homeless people to abate properties where trash builds up. Oakland and other East Bay cities also close camps when sheltered neighbors complain. The name for the new camp is Two Three Hunid Ohlone Village. On Saturday's schedule of events was a blessing ceremony led by an Ohlone Chairwoman Anne Marie Sayers to officially sanction the camp on native land. Organizers of Two Three Hunid Oholone Village are also still seeking the bureaucratic blessing of the city. They said they've been negotiating with Oakland officials for months about insurance and other permissions, but they decided it was time to start building today. The city has already provided several portable toilets and a hand washing station. A landscape architect has already sketched out a preliminary design for where as many as 70 tiny homes could be built. Several tents facing E. 12th Street include information, food, and medical supplies. A volunteer from the Berkeley Free Clinic showed up today offering hepatitis vaccinations. As of noon, about two dozen volunteers were already present, helping some the camp's existing residents clear trash, spread eucalyptus chips, and prepare to raise tiny homes.